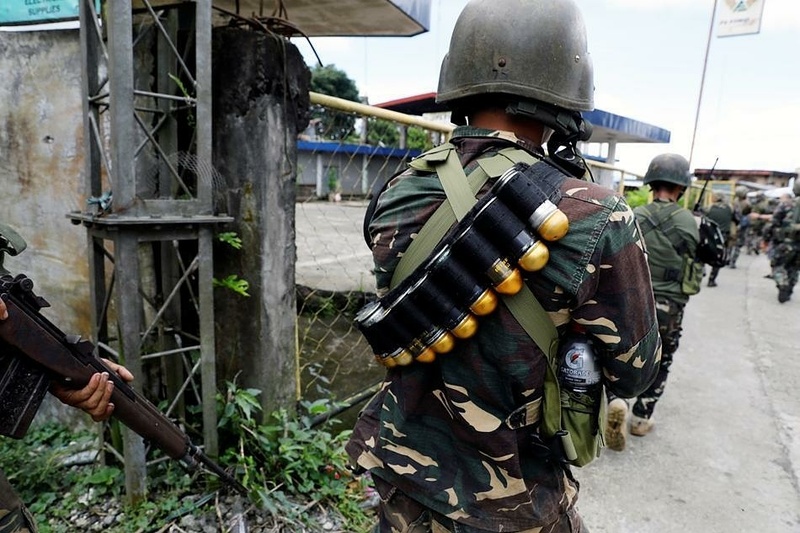 Via The War Files – So far, 130 people have been killed (that we know of) in Marawi. 90 terrorists, 19 civilians, and 21 government troops have died in the fighting. President Duterte said no negotiations with terrorists fighting his country’s military, and occupying parts of Marawi, would take place, and that he’s determined to drive them off the islands. His statement was a turn-around for Duterte who, just last week, urged the Maute terrorists to speak with him in a negotiating sense. As of today, government troops have reportedly cleared almost 90% of Marawi. Among those being held hostage in the city is a Catholic priest. Speaking in a propaganda video, the priest who appears to be under duress, said that he’s “being held along with 200 other captives, including children.” Meanwhile, an estimated 1,000 civilians remain trapped in Marawi. Today, Duterte approved the creation of a “peace corridor in order to facilitate civilian rescues and the delivery of humanitarian aid to displaced persons,” presidential spokesman Ernesto Abella said. As the terrorists resist the effort to take the city, they’ve managed to also capture two armored M113 APC’s and an ammunition/weapon cache from local police.